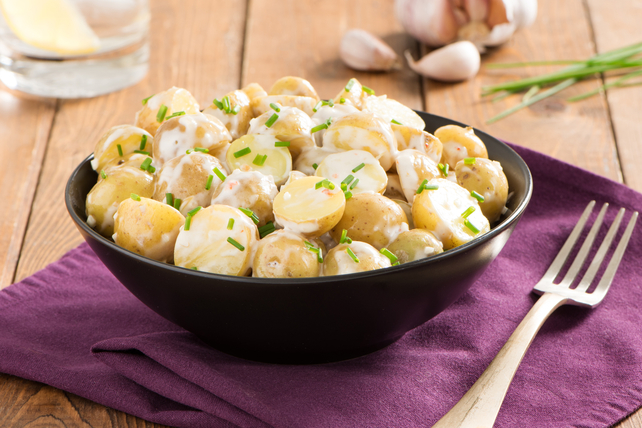 A blend of mayonnaise, Italian dressing and minced garlic is sure to make this potato salad a hit with your entire family. Add chopped fresh chives and prepare for compliments. Cook potatoes in boiling water in saucepan 18 to 20 min. or just until tender; drain. Cool. Mix mayonnaise, dressing and garlic until blended. Place potatoes in large bowl. Add mayonnaise mixture and chives; mix lightly. When cooking potatoes for potato salad, remember that the potatoes will continue to cook even after you have drained them. As soon as the cooked potatoes are fork-tender, drain them and then run them under cold water to quickly cool them.